But the Commonwealth's Flagship Campus would prefer it if students express their hatred for Nazis in ways that do not include the use of profanity if at all possible. Read more. Cultivate's parking lot is currently full with a long waiting line to get into the lot. Plan accordingly. OK, OK, but they also have peanut butter. Oh, and 42 mg of marijuana baked in. NBC Boston reports on the first legal sales of recreational marijuana this morning, in Leicester and Northampton. Read more. MassLive.com takes us on a tour of the CRRC plant now busy putting together those new Orange Line cars. The Massachusetts Appeals Court today upheld a man's conviction for assault and battery with a dangerous weapon for kicking his young daughter in the chest hard enough to send her flying to the floor in a drugstore. Read more. A federal judge ruled today that organizers of a Senate debate this Sunday can exclude independent candidate Shiva Ayyadurai because published polls show him garnering less than 10% of the vote. Read more. On the way back from picking the kidlet up at school in western Mass., we detoured a bit up to Brattleboro, VT - a very interesting place, a bit like Northampton, only with more Subarus, and a bridge that lets you walk into New Hampshire. And we noticed we weren't the only Bostonians to have ever visited. The Not Art guy had been up there at some point and left some of his handiwork. But as you can see, a Brattleboro burgher was having none of it. The report released yesterday on Stanley Rosenberg and his now estranged husband left him little choice. His resignation letter. The city of Houston has created an adopt-a-storm-drain program in the hopes people will clear out their local drains. No money (or JP Licks gift certificates, obviously), but you get to name your drain. A reporter there has compiled a list of some of the names, and you just know the very first one on the list was by somebody who grew up in the Boston area. Valerie Vande Panne checks in from Oklahoma, reports a sense of unease. Meghan captured a hydrant shoveler at work in Medford today. Meanwhile, Thor Olsen shows us just how deep the snow got in one of those snow bands out in Groton: Read more. The rally is set to begin at 3 p.m. at 2100 Roosevelt Ave and last an hour. It is expected to draw high school students from Springfield and Holyoke, and from as far away as Boston, according to organizer Tara Parrish of the Pioneer Valley Project. In 2014, UMass Amherst senior James Haidak made headlines with a lawsuit alleging the college sexually discriminated against him for expelling him in what he said was a he said/she said case involving a UMass student he'd been dating. Yesterday, a federal judge in Boston threw out his suit, saying that while UMass made a mistake in its disciplinary proceedings by delaying them five months, in part because of summer break, Haidak deserved everything he got. Read more. 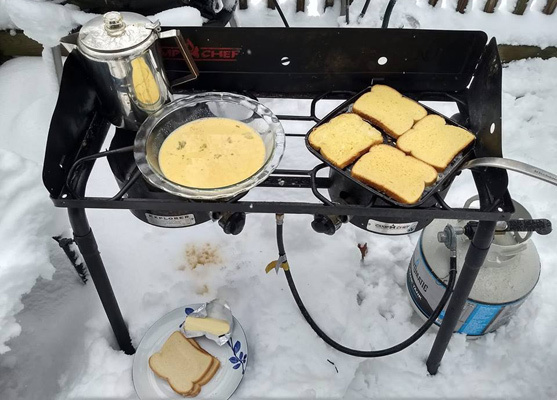 What better time than a nor'easter to fire up the grill and make some French toast? 10 ish inches and no power, no problem. UMass Amherst students gathered on the plaza at the base of the high rises of Southwest quad last night for the traditional post-sportsball riot, which this year resulted in at least 12 people being taken to the hospital and six being arrested after campus, Amherst and State Police in riot gear and on horseback dispersed the crowd with the aid of at least one shot of PepperBall, the school reports. Read more. These signs went up this week in the cafeterias at UMass Amherst, which has the best food in the country and where the motto this week is "You Were. You Are. 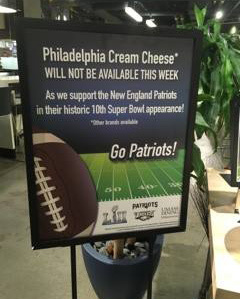 You Can't Get Any Philly Cream Cheese This Week." The Telegram reports Worcester officials have proposed more than $500 million in tax breaks to entice Amazon to move to there, as well as a 20-year holiday from personal-property taxes. The city would also throw $1 million at Amazon to train workers. We took the scenic route out to Amherst to drop the kidlet off at school this weekend (2 to 202 to 9), but instead of heading straight there, once we got to Rte. 9, we headed east for a couple miles to check out our main source of water, the Quabbin Reservoir. Read more. Littleton Police report the death this afternoon of the bull that had been wandering the countryside for several days after it escaped a livestock auction. Read more.